Rep. Teresa Tanzi with U.S. Sen. Sheldon Whitehouse at Clean Water Action’s annual Breakfast of Champions, where she was honored for her sponsorship of successful legislation to phase out cesspools throughout Rhode Island. STATE HOUSE – Rep. Teresa Tanzi has been honored by Clean Water Action for her sponsorship of law passed last year to phase out cesspools throughout Rhode Island. Representative Tanzi (D-Dist. 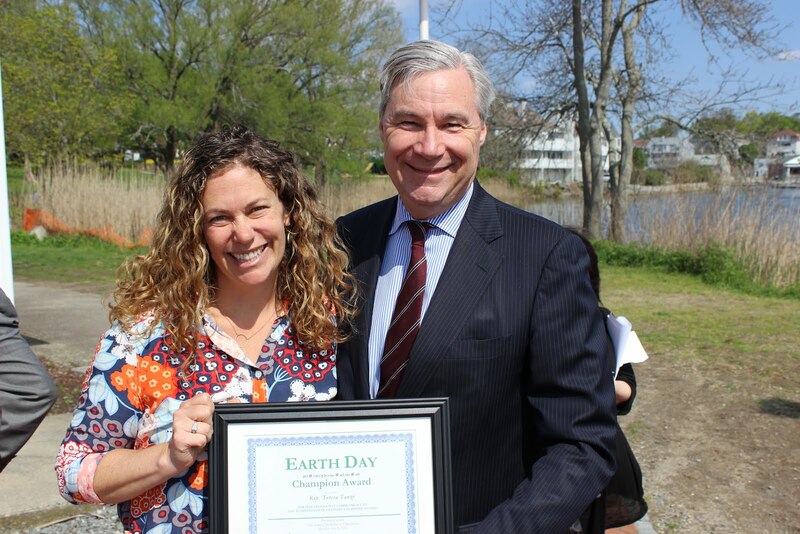 34, South Kingstown, Narragansett) received the organization’s Earth Day Champion award last week at its annual Breakfast of Champions. Representative Tanzi was chosen for the award after many years of sponsoring legislation to amend the Rhode Island Cesspool Act of 2007, which required the phase-out of cesspools located within 200 feet of a shoreline, wetland or drinking water supply. The bill (2016-H 5668A), which passed the General Assembly and became law last year, provides for the eventual removal of all cesspools beyond the previously set boundaries. It requires that any cesspool be replaced upon the sale or transfer of the property where the cesspool is located. “Since her election in 2010, Representative Tanzi has proven herself to be a leader on environmental issues in the General Assembly. Clean Water Action is fortunate to count her as a legislative ally, and we are proud to recognize her as a Champion this year. The work she has done toward phasing out the use of cesspools in our state will undoubtedly improve the water quality of our rivers, lakes, streams, and Narragansett Bay, and enhance the quality of life for all Rhode Islanders,” said Johnathan Berard, Rhode Island state director for Clean Water Action.